I forgot about calculation. I don’t mean that I forgot how to calculate (in which case I probably wouldn’t even be a 1400 player), but rather that I forgot to work on and develop my calculation abilities. During my last few tournaments of the year, I suffered quite a few blunders and managed to lose multiple winning positions. The majority of these conversion slips were linked to sloppy calculation at critical moments. Lacking Theoretical Knowledge. This applies both to the endgame and the opening: most of the time I don’t really know what I’m doing by move five or so, with the occasional exception, and I often don’t manage to achieve the correct theoretical result (whether it be a win or a draw) in a given endgame position. In order to address the two problems above, I will be focusing much more on tactics training with a board and pieces in 2019, as well as powering through Dvoretsky’s Endgame Manual to develop my endgame knowledge. As for opening study, I will start reviewing my lines for at least thirty minutes every day rather than waiting until a tournament comes along and frantically preparing in the final minutes before each game. With consistent effort, and perhaps a bit of luck, I am confident that these changes in my training will reintroduce a positive trend to my rating graph this coming year. It’s time for a new beginning. Following the Washington International, I played in a small local tournament, scoring evenly against slightly lower rated opposition over the course of three rounds. My stagnant results, not only since returning from my summer travels, but also over the course of the past year, have caused me to think deeply about where I see myself in chess. I am currently a junior in high school, and therefore school is always a top priority. Furthermore, other activities such as soccer and jazz band take up reasonably large chunks of time on a daily basis. However, one thing is blatantly clear to me: I am not happy with where I am in my chess journey and want to keep progressing. My enjoyment of chess stems not only from the game itself, but also from my ability to grow in knowledge and skill. Neither “stumbling” from tournament to tournament during breaks from school, as I have during the past year, nor giving up chess completely are paths that I am willing to take. 1 lesson from the Yusupov Series… Monday-Friday: What more can I say? Every day of the school week, I will be completing one lesson from Artur Yusupov’s extensive improvement series. If I am not able to complete a lesson on a given day, I will use Saturday as a “catch-up day” to complete that lesson. As I am almost finished with the first book from the series, exactly fifty-three more lessons lay ahead. These lessons will be the cornerstone of my daily training for the coming months. Coaching and game analysis: I recently hired a chess coach, and will be working with this coach on a weekly basis to help enrich my analysis of tournament games. My hope is that guidance from a strong titled player will help me identify the most gaping holes in my play and patch those holes as quickly as possible. As I have been reasonably consistent in analyzing my tournament games from the past year, I will continue to do so during the coming months. Game analysis and lessons from a coach will be the focus of weekends in particular, when I am not busy with Yusupov study. Playing! I plan to play in two major tournaments during the month of November and will continue to play actively in December and January. It is important to reap the fruit of one’s labor, and therefore I will be playing on a consistent basis as a part of my NM Pursuit. This neat little spreadsheet will keep me on track until the end of October. When pursuing any type of goal, it is most important to understand your “why.” Why am I working hard for this? Why do I want to achieve this? My “why” is that I want to become a national master because it has been my goal ever since I started playing chess competitively, and it would make me incredibly happy to see this goal through. Until next time! On August 8th through 15th I played in the expert section of the 7th Annual Washington International Tournament. It is fair to say that it was one of the most impressive tournaments I have every played in: the top section featured an enormous pool of very strong titled players (including numerous grandmasters), wooden boards with adequate space were provided, and rounds were limited to two per day! Aside from the very pleasant playing conditions, the first half of the tournament could be best described as a cold shower for me. After rarely studying chess for over a month during my travels in Europe, I came back to the board with rather rusty calculation skills and a serious dent in my tactical vision. In the following position, White has a couple of decent options: 27.Re1 is rather natural, to stop Black from trading off rooks on the e-file, while 27.f5 is in fact the most forceful and arguably strongest move. The computer offers the following sharp line to demonstrate what happens if Black tries to trade rooks: 27…Re8 28.Bxb7 Rxe6 29.fxe6 Qe7 30.exd7 Qxe3+ 31.Kg2 Qd2+ = with a draw in sight. However, in the game I played the rather poor 27.Ng4, allowing my opponent to comfortably trade off my rook on the e-file. 27…Re8 (Black is able to swap off his inactive rook for one of white’s active rooks.) 28.Rce1 Rxe6 29.Rxe6 Nb6 and Black’s position is already looking quite promising. A few moves later, my situation began to look hopeless. After 34…Qxa3, Black is easily winning due to his two connected passed pawns on the queenside that will be ushered down by his queen. By some miracle, involving some help from my opponent, I was able to escape from this position alive and managed to draw the game. After coming so incredibly close to a round 1 loss against a significantly lower rated opponent, I played rather safe and uninspired chess in the following three rounds, finishing on 2/4 against approximately 1900-rated opposition. I knew that if I was going to make something of this tournament, I had to step up my game for the remaining five rounds. Step up my game I did! Diet: There is no need for a comparison here! Just like good food is essential to nourish your body, your brain needs nutritious foods to function properly. Cardio/Endurance and Tactical Sharpness: The last thing you want during a difficult workout is to reach cardiovascular failure before muscular failure. Moreover, in a sport or competition of some kind, you won’t be able to apply your strength and skill if you are completely out of breath the whole time. 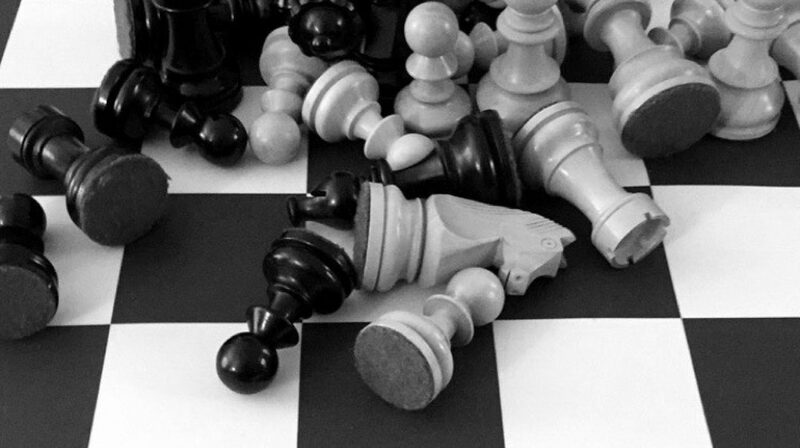 This principle works the same way in chess: there is no point in having incredible positional and endgame skill if you are regularly dropping pieces or missing simple tactics. Tactical alertness is fundamentally essential for any chess player! Strength in upper body and lower body vs. strength in calculation/middlegame/endgame: In fitness it is standard to follow so called “split routines” where one works out legs on one day and upper body the next; these “splits” can be broken up in many different ways. The same principle can be applied in chess: it makes sense to concentrate fully on solving difficult tactical puzzles one day (calculation), studying a master game the next (middlegames), and finally learning endgame theory on the day after that (endgames). Splitting up chess study like this ensures that you get the most out of every session rather than jumping constantly from one aspect of the game to the next, without attaining complete focus. Consistency is key: You won’t get anywhere in fitness if you work out with intensity for 3 weeks straight, and then take a month long break, only to then repeat the cycle. Unfortunately, that is exactly what I have been doing with my chess: it simply doesn’t work! Having a set structure or plan for chess study that you follow every week will guarantee progress if you are patient. Warm up: Before a game or a difficult workout it is always a good idea to warm up and get blood flowing with some easy movements. The same is true in chess: there is no harm in solving 5-10 basic tactics before a study session or game to ensure that you are ready and focused. While some of these points may seem very intuitive, I have found thinking about the parallels between fitness and chess to be very helpful as they have inspired me to form a chess routine that I will stick to. Until next time! With summer coming to an end, I have been thinking a lot lately about what I can do to facilitate chess improvement during the inevitably busy school year that lies ahead. As my daily schedule will be packed with course work and other activities, it will be quite difficult to find time for chess or even just find the motivation to put serious effort into studying the game. When time is lacking and motivation is low, I find good habits to be a fantastic way to keep hopes of attaining a certain goal afloat. When it comes to chess, I have been working diligently on integrating a few positive habits into my daily routine that I can rely on to sustain my improvement during the upcoming school year. While I will no longer be able to study chess for large chunks of time every day like I was during the summer, smaller chess training habits will allow me to keep improving even during the busiest of times. The title explains it all: half an hour every morning of focused tactical training on an online tactics trainer. Daily tactics training is extremely beneficial because it reinforces tactical patterns that crop up perpetually in games and keeps one’s tactical eye very sharp. Since reintroducing tactical training into my daily chess routine, I have been blundering much less often and calculating more efficiently during games. Every day after completing my tactical training, I spend about thirty minutes reviewing a lesson from the Yusupov book that I am currently studying. I strongly believe that reviewing old or previously studied material is just as important as reading new chess material because it ensures that more information is retained. Taking as little as five minutes every day to read a chess article about a recent GM tournament, a strategic principle, or a neat endgame can go a long way to maintain interest in the game. Personally, I have not only thoroughly enjoyed following but also learned a lot from articles covering recent top level events. Over the course of the next month, I plan to stick to these three habits every day so that by the time school comes around, the three activities above will be second nature. Thanks for reading and don’t forget to leave your thoughts in the comments below!